Jim Olivier was a country music D.J. with KXKW Radio for three years before moving to television broadcasting. Starting in 1970, as host of his early morning TV shoe, Passe Partout, for twenty-five years, he promoted Cajun music and local musicians and entertainers every weekday morning. The show became so traditional with Louisiana and East Texas Cajuns that it was said the first thing folks put on in the morning, even before starting the coffee brewing, was Jim Olivier and Passe Partout! I was quite surprised when, one day back in 1980, Jim walked into my office with songwriter/musician, V.J. “Boo” Boulet, and a tape they had just finished recording of Jim singing two Cajun songs. I knew Jim had been exposed to recording studios, musicians, and the entertainment business for years, so it was not unusual for him to want to venture to try to fulfill a lifelong desire to become a recording artist. But the fact that it was Jim on the tape singing, and that he was singing Cajun songs, and that they sounded so good, was a pleasant surprise. I decided to release Jim’s first 45rpm Cajun single, “Brasse le Couche-couche,” and it was an immediate success! After the successful single release, we decided Jim should record an album. Boo wrote several new songs for Jim’s first album, including the hits “If You’ll Give Me Another Chance” and “Comme Un Cadien (Just Like A Cajun).” Jim’s version of “I Love My Saturday Night” became a classic hit also. The entire album had a full and exciting “make you wanta dance” sound, and Jim’s distinctively fresh, new, smooth vocals complimented the music. The album got a lot of folks interested in Cajun music again. Jim passed away April 13, 2008. 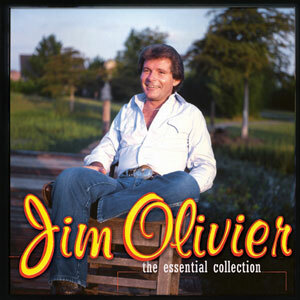 Jim Olivier was a country music DJ for three years before becoming host of “Passe Partout,” a morning TV show that he hosted for 25 years. In 1980 Olivier recorded “Brasse le Couche-Couche,” which became a local hit. That first single isn’t included on this compilation, but the collection does present 19 songs from his five albums, as well as one new song. Olivier was the top-selling Cajun artists on Swallow during a six year period, and some of his most popular songs were “Bourbon Street Cajun” and a novelty song called “Marriage e Pic et Poc.” Olivier’s pianist-producer V.J. Boulet wrote some of the material, but the band also included Rod Miller on steel guitar, so a strong country influence permeates some tracks. This compilation also includes three songs by Belton Richard, including “Musician’s Paradise,” and a bilingual swamp pop rendition of a song originally done by Fats Domino. The closing track is a new recording, a French version of another Domino song and a track that’s as good as anything on The Essential Collection, an album that aptly titled because it probably does included everything most Cajun fans might need of Olivier.